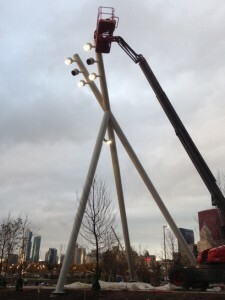 Exergy Controls Remote Lighting Controls adorn the giant arcing lights posts at Chicago’s Maggie Daley Park. Exergy Controls is excited to have been apart of the completion of Chicago’s new Maggie Daley Park. The park is finally open to the public as of December 13. The new park is a unique addition to Chicago’s landscape, complete with architectural thrills and modern design, including signature elements like rock-climbing sculptures, an ice-skating ribbon, and play garden. Exergy Controls was selected to provide our remote lighting controls and software technology to the parks lighting systems, including it’s signature 50 foot tall Light Masts that create a “moon-lit” glow across the lawn valleys. To get a better look at the park, check out this live camera posted high above the park or stream a time-lapse movie of the park’s construction.